Chia seeds are one of the healthiest, most nutrient dense foods on earth, and are especially great for horses. Chia seeds can be used as a natural replacement for many supplements because they already contain many of the same nutrients. As a natural product, chia seeds are more palatable for horses and dogs and easier to digest. 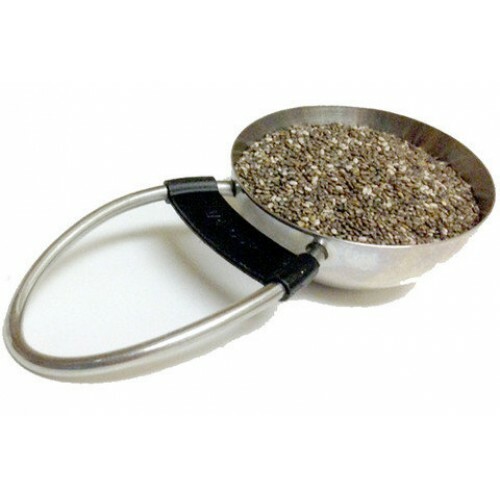 DIGESTION: Chia seeds help to optimize the digestive tract, and are great for ulcer and colic prevention. They're also ideal for horses and dogs who suffer from metabolic disorders. JOINTS & MUSCLES: The anti-inflammatory properties of chia seeds help reduce pain and swelling. As a complete source of protein, they also build muscle and topline. SKIN, COAT & HOOF: Chia-fed horses have healthy skin, glossy coats, and stronger hooves. Laminitis symptoms may also be improved by feeding chia. Chia-fed dogs have healthy skin and glossy coats. CALMING: High in Magnesium, chia seeds have a natural calming effect on horses and dogs. ALLERGIES: The high Omega-3's found in chia help to boost the immune system and reduce swelling, giving horses and dogs relief from allergies. HYDRATION: Chia seeds keep your horse and dog hydrated and retain electrolytes, promoting faster recovery times and increased longevity. WEIGHT MANAGEMENT: Whether your horse or dog needs to gain, lose or maintain weight, chia seeds can help them achieve the proper body condition. Chia has a long shelf life - Chia is proven to withstand extreme temperatures of -20 to 110 degrees F. The natural abundance of antioxidants stabilize the vitamins, minerals and fats. Chia seeds have a 5-year shelf life without going rancid, unlike corn oil, wheat germ oil, and other fat supplements that can quickly become rancid if exposed to heat, air, or light. One of the biggest benefits of adding chia seeds to your horse's diet is the promotion of optimal gut function. Chias help your horse’s digestive tract in several ways, such as helping to sooth and prevent ulcers, balance blood sugars, and prevent colic. Looking at things from a big picture perspective, properly caring for your horse's digestive tract will maximize the nutrient absorption from forage, feed, and other supplements or medications. This ensures the money being put towards providing quality nutrition for you horse is not spent in vain. Research has shown that ulcers are a common problem for many types of horses. 90-100% of race horses have ulcers, and over 60% of performance and pleasure horses have or have had ulcers (Bell et al., 2007). In fact, horses that don’t show clinical signs of gastric ulcers may in fact be affected, even if they are not in an intensive work program (Luthersson et al. 2009). Ulcers cause stomach pain, often resulting in a horse going “off feed.” The reduction in dietary intake may cause weight loss and nutrient imbalance. With less forage (and therefore, saliva) to help buffer stomach acid, ulcers may become worse or at the very least prevent your horse from wanting to eat his normal diet. Chia seeds contain mucilage, a naturally occurring, gel-like substance found in most plants. Mucilage is often used in medicine to help soothe the pain and inflammation associated with gastric ulcers by forming a protective barrier on the mucosal surface (Borelli and Izzo, 2000). Clinical data in horses is limited, but mucilage is non-toxic and a safe component of chia seeds. Large meals that are low in fiber or feeding less frequent meals can be harmful to a horse’s digestive tract. Horses are constantly producing acid in the stomach, but only produce enough saliva to neutralize the acid when they are chewing. Thus, horses that are able to munch on hay or grass all day, as they evolved to do, have a constant, natural acid buffer provided by forage and saliva. As chia is high in fiber, it helps to slow the passage of food through the digestive tract allowing more time for the buffering of acid. It is important to note that chia seeds are not a medical treatment for horses with ulcers; rather it is a helpful additive in the prevention of ulcers. As horse owners, we know that colic is not to be taken lightly. Chia seeds are 40% fiber and have a high concentration of soluble fiber (27%) – more than wheat, oats or flax. When exposed to moisture, chia seeds form a mucilage-type gel that supports digestive motility. The gel helps to pass sand and food through the gut, preventing impactions down the road. As a mucilage gel, chia seeds can retain up to 10-12x their volume in water. Keeping your horse hydrated is important for preventing colic throughout the year and for helping to keep the digestive tract moving normally. Many horses suffering from diseases such as Cushing's Disease, Equine Metabolic Disorder or Insulin Resistance derive great benefits from chia seeds. Chia has become a more common dietary supplement for human diabetes patients because of its ability to stabilize blood sugars and it's near absence of non-structural carbohydrates (NSC). Chia likely has a similar effect in horses. As chia passes through the horse's system, the seeds become a mucilage consistency, which slows the digestive enzyme's breakdown of carbohydrates. Many horses are on a grain-based diet, which goes through the digestive tract much faster than forage. By better slowing down the metabolism, blood sugar spikes and the associated stress on the horse's system will be greatly reduced. Additionally, chia seeds high in magnesium and omega oils (which many IR horses are deficient in), and contain almost no starches or sugars. Arthritis can be a career ending issue for performance horses, and is typically treated with anti-inflammatory drugs, such as phenylbutazone (bute) and corticosteroids – both of which are associated with negative side effects from prolonged usage. Omega-3 fatty acids are helpful for the treatment of arthritis and lameness. When properly balanced with omega-6, omega-3s help reduce the production of prostaglandins, which are hormone-like substances that cause inflammation. Chia seeds are one of the highest natural plant sources of omega-3; and equally as important, they contain the optimal ratio of omega-3 to omega-6. Using chia seeds to treat horses with arthritis and lameness can allow for a natural recovery without the adverse effects of NSAIDs or bute. Additionally, chia seeds are permitted under the USEF as a therapeutic substance, making them ideal for treating performance horses. At 18%, chia seeds have much more protein than other seeds. The high quality protein gives them the full spectrum of amino acids, making them a complete protein source. Adding chia seeds to your horse's diet will help them naturally build better muscle and topline. As a result of the high levels of omega-3 fatty acids in chia, US Chia customers have noticed their horse's coats are shinier, richer in color, and much more dappled even after just 30 days on chia seeds. Proper nutrition is critical for healthy hoof growth and integrity. Chia seeds contain nutrients that are important for strong, healthy hooves. Chia seeds offer complete protein, meaning that they contain all 9 essential amino acids. These amino acids help build proteins, including keratin, a fibrous, structural protein that plays a key role in maintaining hoof strength. Chia also contains calcium and phosphorus to support hoof growth. Laminitis is not just a foot problem. The whole health of the horse needs to be taken into consideration. The soluble fiber in chia seeds can help to slow the absorption of glucose, preventing spikes in blood glucose. Keeping blood glucose concentration steady reduces the risk of a laminitis flare up. The forages that horses evolved eating contained higher amounts of omega-3 fatty acids compared to omega-6 fatty acids. In today’s world of highly fortified, grain-based feeds, that ratio is reversed. Supplementing with chia seeds helps to increase dietary omega-3 fatty acid. The fat content in chia seeds can be an excellent source of energy without providing a “sugar rush.” Fat is metabolized very slowly compared to the sugars that make up carbohydrates. Adding chia as a fat energy source can help maintain a steady release of energy without causing large bursts of (and subsequent pitfalls) of energy associated with large amounts of starch and sugar. The fat and fiber content of chia seeds may support a slower, steadier absorption of dietary nutrients, helping to reduce large spikes in energy, therefore helping to create a more even supply of energy and minimizing excitability. Chia seeds also contain magnesium (Mg), which is included in many calming supplements for horses today. The Omega-3 fatty acids in chia fight allergies in several ways. First, allergies are typically a result of an over-reactive immune system. Omega-3s help both regulate and strengthen the immune system, thus working to ward off future allergic reactions. Boosting the immune system also lessens the risk of developing infections as a result of combating allergens. Secondly, the Omega-3 fatty acids in chia seeds have been shown to improve asthma control in humans (Barros et al., 2011, British Journal of Nutrition) and inhibit histamine release (a substance involved in immune responses) (Kawaski et al., 1994). Asthma patients and people with inflammatory airway problems have better control if their diet includes Omega-3 fatty acids (even ALA). If left unattended, chronic inflammation can lead to long-term respiratory problems, potentially inhibiting the horse’s performance and quality of life. Lastly, the soothing effects for the Omega-3's on the skin, reduce dryness and itchiness in horses suffering from chronic skin allergies. When you're breeding horses, you want to make sure everything is perfect. Nutrition is a huge part of keeping both stallions and broodmares happy and healthy. 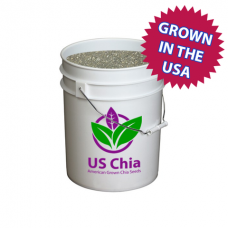 US Chia Seeds can be a great addition to the feed program for your breeding prospects! Pregnant mares must consume enough nutrients to keep their own body weight, as well as create new tissues. This is important over all three trimesters of the pregnancy, especially the last one. The natural high fat content of Omega-3's and fiber helps your mare gain weight and consume digestible energy without any starch or sugars. Studies have shown that Omega-3 fatty acids can improve conception rates and the ability to carry to term. Thus, mares with a history of abortion may benefit from this nutritional support. These same fatty acids have been shown to benefit the fetal nervous system and overall development of the fetus. Mares on a high Omega-3 diet may produce richer colostrum, producing a healthier foal and reducing the risk of gastric ulcers (KER: A Closer Look at Fats). Protein is another important factor during pregnancy. US Chia Seeds contain 18% protein, and the full amino acid spectrum, making them a great addition to your broodmare's diet. Chia also contains essential minerals including copper, iron, sodium, potassium, magnesium, zinc, phosphorus, and calcium. Some vitamins, including vitamin C, E and A, are also found in chia seeds. Chia seeds are recommended for horses in intense work to support exercise recovery because of their absorptive properties. With high fiber content, they absorb 10-12 times their own weight in water. Integrating soaked chia seeds into your horse's feed regimen can help prolong hydration and retain electrolytes in bodily fluids. These benefits support better endurance, faster recovery, and increased longevity for equine athletes. Whether your horse needs to gain 100 pounds or lose 100 pounds, chia seeds can help them achieve the proper weight. Chia promotes weight management in several ways. For starters, it is a healthy source of fat at 32%, with a proper 3:1 ratio of omega 3 to omega 6. Fats that have an inverse ratio (such as vegetable oil) can often increase inflammation. Additionally, chia seeds contain no sugars or starches -- giving your horse the nutrients they need, without the negative side effects of feeding increased amounts of grain. Building from that, the hydrophilic property of chia increases horses' digestive motility. Put more simply, chia's high fiber content causes it to turn gelatinous after contact with moisture, and it passes through the gut in this form. This has several effects, including balancing metabolism, regulating stool movement, and clearing sand or debris from the intestinal tract. By optimizing digestion, you can ensure that your horse is getting maximum nutrient absorption from feed, hay and other supplements (or lack thereof) and encourage them to eat regularly throughout the day as their bodies were designed to do. These two facets in tandem help your horse gain or lose weight in a healthy, natural way.